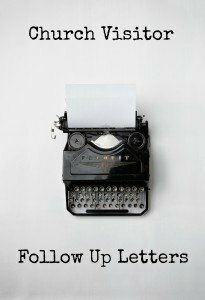 I have written before about different ways to follow up on church visitors, but want to share with you some current life experiences of followup letters. We filled out church visitor cards. one handed to us by the church usher. Each of these manners to collect visitor contact information are good practices. I prefer a separate stand alone card in a seat pocket or pew rack, rather than a tear off because of the ripping noise. I am not a fan of the registration books that are passed down the aisle, but these are personal preferences. What happened with our visitor card? From three of the four churches, we received a follow up letter in the mail. We received a Dunkin Donuts gift card and a Chik Fil A coupon as thank you gifts. One church sent a form letter from the pastor, but also a hand written thank you note. One church pastor called us and invited us to his house for lunch. Three of the four churches made an attempt to follow up using the information they received from us on the card. Church A sent a letter, a hand written thank you note, a Chik-Fil-A thank you gift. Church B sent a letter, a personal phone call from pastor. Church C sent a letter and a Dunkin Donuts gift card. A review of follow up letters. Of the follow up letters we received from three of the four churches, one letter really caught our attention. If I were to rank them in order of attention grabbing, this would be number 1. Follow Up Letter Number 1. This particular church visitor letter told us about the upcoming Pastor’s Luncheon. It mentioned there is no cost, and that all the food would be home cooked. It clearly described the date, the time, and the location and personal invitation to attend. The church visitor letter also introduced us to some of the mid week programming. The strength of their description is how it might benefit our family. They went beyond the invitation to come and focused instead on why we might want to adjust our busy schedule to start participating in their mid-week programming. The visitor letter from the church concluded with an invitation to come again the following Sunday for the next sermon in the particular series. Church B sent a visitor follow up letter that described the congregation as a family. We were invited to become a part of it. The letter told us a little about the church’s particular mission and purpose in the community. This church visitor letter reminded us of the Sunday service times and a personal invitation to come again. Church B also has a monthly Pastor’s luncheon at the Pastor’s house with a home cooked meal. While the letter from Church B did not mention that invitation at all, we did receive a personal phone call from the Pastor himself inviting us to his house for lunch with other first time visitors. We enjoyed lunch with him and his wife. I found it interesting at this lunch that the other first time couple making this lunch had already volunteered to cook it. They had made the decision to get involved in this church after the first Sunday. As I read the letter, I could not tell anything about the church or it’s ministries, or even why they might want us to return. One church really used their connection card. Out of the four connection cards we filled out, only two churches used that information more than once, with additional follow up contact that felt appropriate and timely. Church A, which sent us a letter to the Pastor’s Luncheon, also sent a hand written thank you note card. That extra effort has continued to ease us into their community life. Church A also sent a second letter inviting us to the Pastor’s luncheon and also gave us a phone call of invitation. These may have been triggered by a record of our repeat visit, but none the less, it was a gentle and non intrusive follow up. We attended the Pastor’s Luncheon where we learned a little about the church. It was a simple affair, and the pastor was very clear about the simple next step to get involved. Church D made no effort to send us a follow up letter, make a phone call, or make any attempt to follow up with us a first time visitor. In spite of no letter, we will never forget the church greeter there. Are you still attending our church? If not, we will delete you. If you are, please let us know. My family found it odd that the church that never made any effort to invite us back took the time to mail us a letter that we would be deleted. My suggestion would be to include the following items. A thank you for attending. An invitation to the next sermon in the series. A thank you and personal invitation to contact you or another pastor on staff. A volunteer project in the community. Whatever you invite your first time guests to, make sure it is a simple clear step that is easy to follow. No matter what your next step is, your church visitor may not know. Find ways to communicate that next step for your first time church visitors. Do not assume that they will know. If you send a follow up letter, what do you say? Share some of your ideas in the comments below. We love you to visit us in East Africa Uganda. I’m a new pastor and found this article very helpful. I changed what I put in my visitor letters because of it — it makes so much sense! Thanks very much. Thank you for this article. We want to make our guests feel welcome and make connections with members of our church. Thanks for stopping by Dianna! That invitation to a simple next step is an important part of that letter. . . This was very helpful information, we will definitely be changing our letters to reflect a more personal invitation! Thank you for sharing. I really enjoyed this post. Can I have permission to print/hand this out to pastors at an upcoming pastor’s conference? Please include the direct link at the bottom as you cite the source. Thanks. The sad part about this site was trying to read it. On the left are icons for FB, twittr, etc. The long list covers 75% of 1/4 of thd page. Tough to try reading this page. I finally gave up. Thank you for letting me know. I’ll try and figure out what size screen you looked at so i can figure out what settings I need to adjust. Since you didn’t tell me what device you were using, I may have a hard time guessing or duplicating your experience, but I will try to work on it.